Before the helicopter even landed, I was getting chills. 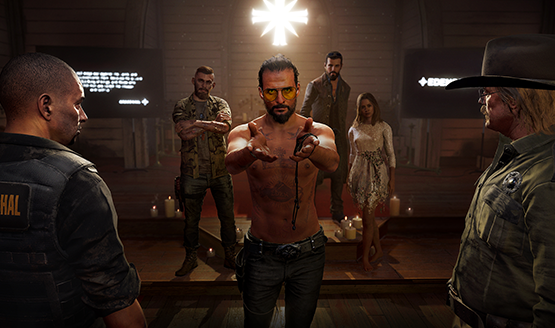 We were heading to Hope County, Montana to arrest Joseph Seed, a cult leader known as The Father, surrounded by the protection of his fanatical followers. Something didn’t feel right though. We were there to arrest one man, so why did it feel like we needed an army? We were allowed to land in the compound and walk to the church relatively unchecked, piercing glares from gun-toting cultists the only thing that followed us. Despite warnings from the sheriff, we do things loud. Approaching the front of the church, the US Marshall announces his intent to arrest Joseph Seed. The Father is eerily calm, framed by his two brothers and sister, as if daring us to lay a hand on him. Following numerous overtures about how God will save him, I clamp the cuffs on The Father and begin the perp walk back to the helicopter. His followers are agitated, and it doesn’t take long before a shot rings out and all hell breaks loose. We run quickly to the chopper and take-off, still accosted by throngs of people with a single intent: Save The Father. Bodies dangle from the lower supports. One man propels himself into the helicopter blades, showering the windshield in blood and sending the helicopter crashing to the ground. The other law enforcement officers are dragged away, but I narrowly escape. Far Cry 5 opens by putting you right in the mouth of the dragon, facing The Father and his siblings. It might seem like an over-the-top take on rural America, but right away, Far Cry 5 sets a tone of believability in a hellish landscape that you might think could never happen. It doesn’t just set a cult following in the middle of America without addressing how and why they are able to get away with what they do. What happens in those remote parts of the country where cell service is lacking? An increasing reliance on technology makes isolation believable when connection to the outside world is taken away. Far Cry 5 feels closer to home than ever being in the United States, while at the same time feeling so isolated. The comforts of peaceful living are gone. There’s nothing between me and the cult except a gun and the resistance. And maybe a bear. After a brief introductory period, Hope County was open to me I could immediately start to take on missions and fight back against the cult, or I could wander the wilderness, catching fish and hunting wildlife. The structure of Far Cry 5 is such that no two playthroughs will ever be the same. Each player can tackle Hope County exactly how they want to, and there’s a lot of freedom provided from the drop. Each of the three main regions are controlled by members of the Seed family, while The Father himself occupies the compound in the middle. My play session focused on the northern area known as the Whitetail Mountains, held by Joseph Seed’s militaristic brother, Jacob. Notably absent are towers that unlock points of interest on the map. Far Cry 5 takes a far more organic approach to exploration of the area. Talking to a local might provide a hint of side mission or other objective. Looking at a map in a building could make additional points of interest appear on your own map. Hope County requires active discovery, and there might even be incorrect or incomplete information given in some cases. It’s a change for the better that makes Far Cry 5 feel a lot more interactive, and less like a boring checklist of things to do in the open-world. 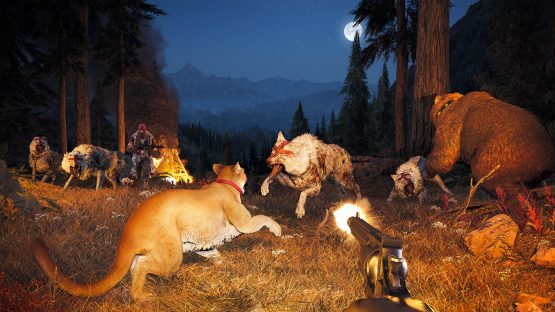 Animals are dangerous in Far Cry 5, for both sides. That bear is named Cheeseburger, and he’s an ally. The player character in Far Cry 5 is supposed to be an avatar of the player, not a specific character themselves. You can choose a male or female at the beginning and there’s a full suite of clothing customization options. Unlike Far Cry 4, there’s no personal quest involved, and unlike Far Cry 3, your character isn’t preestablished, aside from being a deputy. It’s a case of wrong time, wrong place. You aren’t special. You’ve simply been dropped in the middle of a terrifyingly bad situation, and the story that plays out focuses entirely on the cult, the resistance trying to fight back, and life in Hope County. It’s that disconnect that allows Far Cry 5’s Montana sandbox to work so well. Your “mission” in Hope County is largely one of moral choice and isolation, not of necessity. In the couple hours I had in the Whitetail Mountains, I liberated a wildlife center from the cult, went fishing, befriended a bear named Cheeseburger, failed miserably at a wingsuit course (first-person wingsuiting is hard! ), helped to steal back a truck for Hurk’s right-wing conservative father, and got kidnapped and drugged up by Jacob Seed and his religious gun-toting goons. 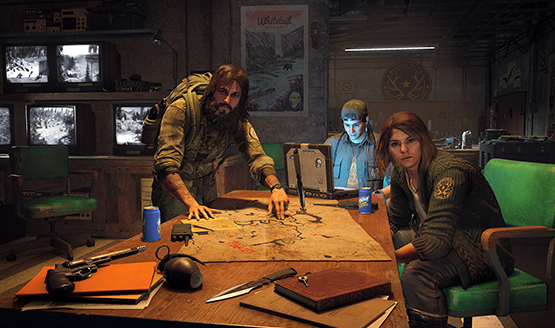 Yup, that’s right, Hurk’s back, and this time he’s brought along the entire family. You can do missions for all of them, and Hurk Sr. in particular adds quite a blatant connection to modern politics, more so than a gun-loving doomsday cult. Co-op makes a triumphant return, now allowing players to play story missions together as well as nearly every open-world activity. The one thing I do worry about is how they will mark progress and what will carry over from a co-op session to your single-player game. I wasn’t the host for my short time with co-op, so I had no ability to choose any missions myself. We played a mission that I hadn’t even discovered during my solo time, and then replayed a mission that I had already done before, but I was unable to see how those would have affected me had I gone back to playing solo. Aside from those concerns, co-op is pure Far Cry 5 with a friend. Customization allows each player to look different, and setting up/joining lobbies seems really easy to do (we didn’t get an in-depth look at this process). Taking down a cult is more fun with other people, but if you just want to crack a brew and catch some fish together, you can do that too. Hope County is your playground, with or without a friend by your side. The resistance is scattered across Hope County, often in underground bunkers. Picking America as the place to host Far Cry 5 feels strangely appropriate for the next evolution of the well known franchise. Hope County, Montana feels familiar, but so foreign, like an uncanny version of your own home. The game itself feels the same way. It’s definitely a Far Cry game, but they’ve done a lot to tweak the formula and make it feel different. Ubisoft has taken many of the game elements and woven them into the interactions to not feel so rote and formulaic. There’s still a Far Cry game at the center, but it feels like a more natural evolution of the style. Far Cry 5 is as exciting as it is different. It’s refreshing to take on the familiar , yet still have it be a Far Cry from what we’re used to. Despite everything I was able to do, a few hours is not long enough in Hope County, Montana. I can’t wait to revisit when the game actually releases later this month. Far Cry 5 preview build played at an event held by Ubisoft. Travel and accommodations were provided.